Today is World Book Day and many children are going to school dressed as their favourite book character. When I asked Bob what her favourite book was she had a hard time deciding. She loves books and there are so many that she enjoys! She decided that ‘What The Ladybird Heard’ was her favourite. I said that I could make her a ladybird costume and she was quite excited. I explained that I could make her a red padded shell with black spots out of fabric. She could then wear black leggings and a top. As soon as she heard that the body of the costume would be black she lost interest. She is not a fan of black. She wanted to be a ladybird with a pink body. I wasn’t sure that would work so we went back to the drawing board. Her next choice was to be the witch from Room On The Broom. She has 3 witch outfits so I knew that this wouldn’t be a problem. I told Bob that I could plait some orange wool so that she could have ‘long ginger hair which she wore in a plait’. Bob didn’t like this idea either. Eventually she decided that she would like to be Goldilocks. 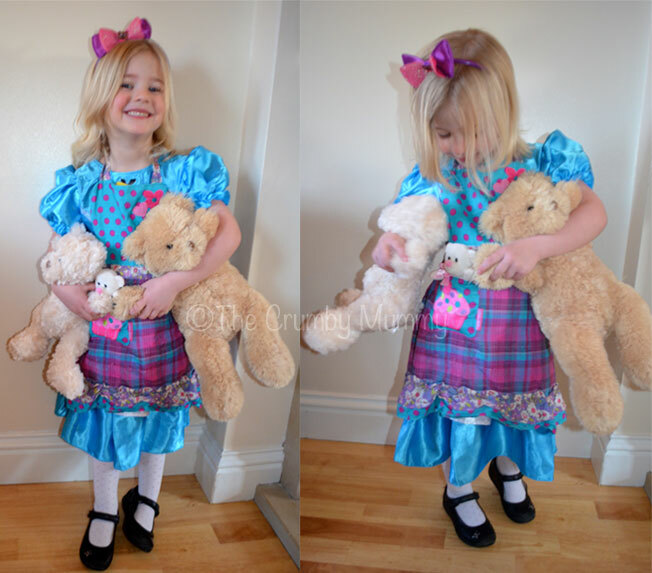 Bob didn’t have a Goldilocks fancy dress outfit so we had a look in her wardrobe and on her fancy dress rail to see if we could cobble something together. 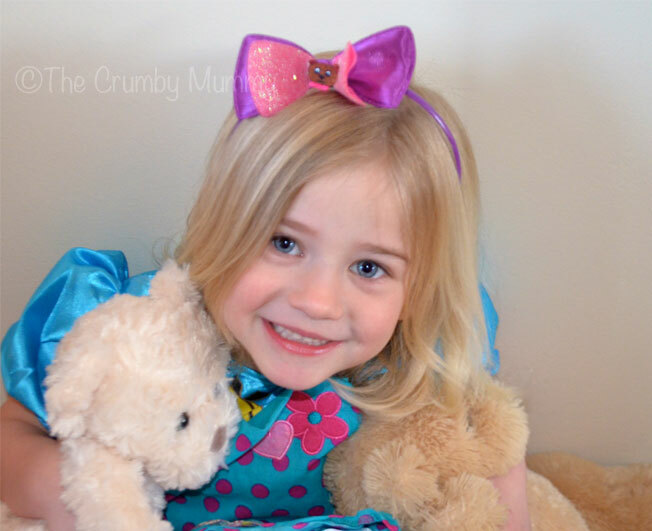 An Alice In Wonderland dress, a baking apron, a Rapunzel head band, a tiny drawing of a bear and 3 teddy bears later and Bob was Goldilocks! She loved her outfit and she couldn’t wait to wear it! Every day, when she woke up, she asked if it was book day. Today she skipped to school and she couldn’t wait to show her friends and teachers her costume. We also had to take a photo of Bob reading in an unusual place. 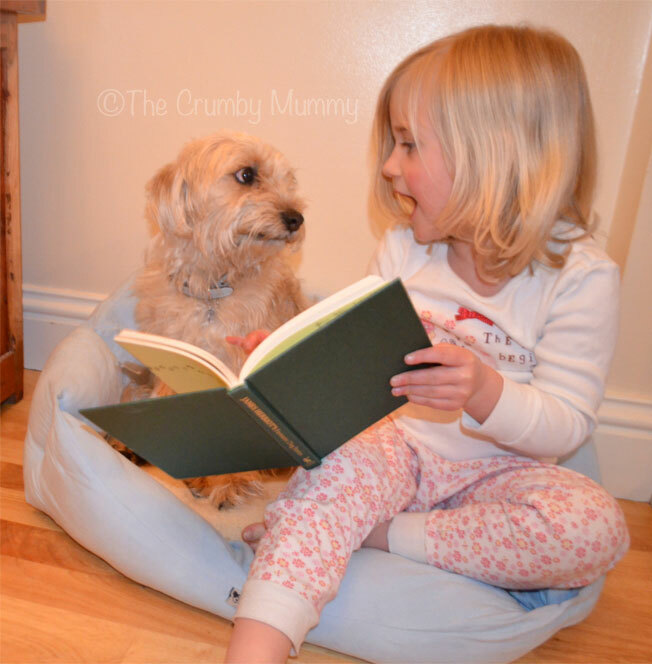 Bob likes to read Sally a bedtime story. She climbs into Sally’s bed to do this which I thought was quite unusual. I hope that you all have a lovely World Book Day! That is the cutest thing ever! !